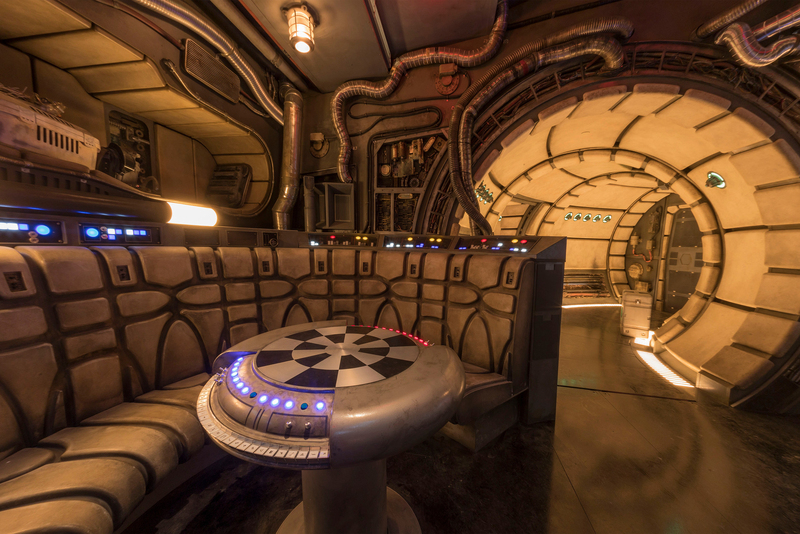 As we continue to sift through the new details released tonight about Star Wars: Galaxy’s Edge, we have a wonderful description of the experience that awaits guests in Millennium Falcon: Smugglers Run. The following highlights comes from EW, and contain spoilers for the attraction. The line starts at ground level curves along the back of the Falcon, so visitors can get a closer look from that perspective. From there, you climb a set of stairs that lead to catwalks circling the mechanic shop, where other ships and engines are under repair. Along the exterior wall, there are some narrow, triangular windows with a close-up view of the radar dish atop the Falcon. Around the next corner, the line bends along a bank of picture windows with a long, unobstructed view of the top of the Falcon and the town of Black Spire Outpost beyond. As you head back into the depths of the shipping center, the Disney Play app on smartphones allow visitors to scan shipping crates, revealing the true contents of what Hondo Ohnaka is trying to send around the galaxy. Soon, you’ll enter the control room. Standing on the bridge, waiting to greet you with his sales pitch, is Hondo Ohnaka. The alien with the spiky beard and turtle-shell skin has a jolly disposition, despite a lifetime of desperation. The figure looming over you is a state-of-the-art animatronic, with dialogue delivered in his signature Russian/Caribbean accent by Winnie the Pooh voice actor Jim Cummings, who performed Hondo on the animated Star Wars shows. “What Hondo would like to present is a very above-board operation, but we come to learn it’s more nefarious than we believe,” Kalama says. While the Hondo animatronic assesses the roomful of would-be smugglers, his assistant — the grubby astromech droid R5-28, summons the Falcon. At this point, guests have already been assigned a flight group and a number. Hondo and Chewie need two pilots, two gunners, and two flight engineers for each run. An operator will call out the number of each group when it is time for takeoff. In the meantime, you are free to roam about the cabin. The Smugglers Run ride has a choose-your-own-adventure quality that allows your actions to determine the outcome of the mission. The details of the mission are yet to be revealed. When the flight is over and you return to Batuu, you land in the same town square, then descend into the basement of the shipping center for an exit on the outside. There you’ll see the Falcon parked right where you left it. Your reputation as a smuggler will travel with you, however. The Disney Play app on your phone tracks your experience and transmits that information throughout Galaxy’s Edge.